“Lowland Rescue? What’s that then?” the cashier asked when she saw my uniform jacket. I had attended a call out straight from work. I keep my gear in the boot of the car because we never know when we might be called, and I changed in the toilets before driving for an hour to get there. Fortunately it had been a quick and successful search, the missing person had been located alive and well within half an hour of us starting. All of this meant that I was feeling very good when I stopped at a service area before getting on the motorway home. “Is it about dogs or something?” She continued. We get this a lot. 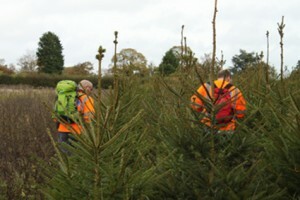 Everybody’s heard of Mountain Rescue, but very few have heard of Lowland Rescue. So who are we and what do we do? 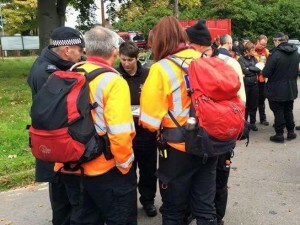 Put very simply, our primary function is to look for vulnerable lost and missing people. We are called out by and work under the command of the police when they need search assets for wide area or large scale searches. The Police will assess every missing person. A Police Search Advisor gathers all the information they can on who they are, where they were last seen, what they like and where they are likely to go. With that information they can tell us where to start looking. We take it from there. The people we look for vary. They might be suffering from some form of Dementia, they could be despondent, lost children or there might other circumstances that make someone vulnerable. Our search planners study the behaviour of vulnerable people and come up with a plan of where to search first. Our team members gather at a rendezvous point and we are sent out in small teams, each containing a leader, first aider, navigator and communications operator. We train in all the functions, although team leadership takes some extra training. We’ll tell you more about that in the future. More importantly we are all searchers and we work as a team. It doesn’t matter which team a Lowland Rescue searcher belongs to, we are all trained to the same standard and we are all able to work in mixed teams. We search carefully. We look primarily for people so we are able to move quite fast. Once an area has been searched we’ll be re-tasked to another. Sometimes another team or a dog will be sent back into a searched area if the planner thinks there is value in searching in a different way. We will search for as long as it takes. Already this year we have taken part in multi-day searches, but the best ones are short and the missing people are alive and well. However long it takes, you can be assured that we’ll take good care of the missing people when we do find them.